In Astah, parameterized list types can be represented by using Template Binding. 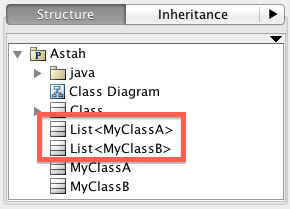 In Astah 6.7, directly entering "List<MyClassA>" in Type can create a Class that is using Template Binding. (1) Create a Class Diagram and a Class and add an operation to the Class. (2) Directly enter "myMethod(param1 : int, param2 : List<MyClassB>): List<MyClassA>" to its operation. And when you see the structure tree, you can see that "List<MyClassA>" and "List<MyCassB>" are created which are used Template Binding. To see the Template Bindings of these Classes, bring them onto diagram from the structure tree, and select [Show Hidden Relationships] from its pop-up menu. You can see Template bindings like below. Also regarding the name change, when you rename "MyClassA", that will be reflected to the "List<MyClassA>"
Hope this helps. If this doesn't meet what you were asking, please let us know.